Alumni Sanjay Mehta and faculty Doug McClement and Michael Philip Wojewoda win CSA. 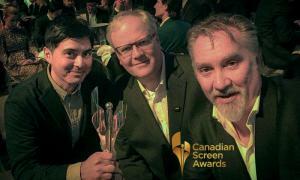 TORONTO, ONTARIO, CANADA, April 15, 2019 /EINPresswire.com/ — Harris Institute alumni Sanjay Mehta and faculty members Doug McClement and Michael Philip Wojewoda won the Canadian Screen Award (CSA) for Best Sound, Non-fiction for 'Gord Downie's Secret Path in Concert'. Faculty member David Quilico and alumni Janet Baker and Mishelle Pack (Sony/ATV Music Publishing) won 10 SOCAN Awards and alumni Jamie Appleby (Wax Records) co-wrote the SOCAN Award winning song 'Not a Love Song' with bülow. Faculty member Yuri Gorbachow and alumni Lise Beauchesne won the MPSE Golden Reel Award for Outstanding Achievement in Sound Editing for 'Vikings'. Alumni Eric Ratz won the Jack Richardson Producer of the Year JUNO for Arkells. Alumni Jamie Appleby manages bülow, who won the Breakthrough Artist of the Year JUNO. Alumni Sean Karp, Noah Siegel, Charles Duchesne and Igor Bezuglov won 5 CSA’s for 'Dino Dana' and 'Odd Squad'. Yuri Gorbachow, Director of Audio Post at Harris, won the CSA for Best Sound, Fiction for 'Vikings'. Alumni Sean Karp, Noah Siegel and Charles Duchesne are nominated for the Daytime Emmy Award for Outstanding Sound Editing for a Live Action Program for 'Dino Dana'. Harris Institute is the only post-secondary school in North America to achieve a 100% Graduate Employment Rate, a 100% Graduate Satisfaction Rate and four 0% Student Loan Default Rates. It ranked best private school for a 7th year in the 2019 ‘Media Arts Education Report’ and is the only school outside the US in Billboard‘s ‘Top 11 Schools’. The college specializes in comprehensive audio and music industry education taught by active award-winning leaders. Twelve-month Diploma Programs start in March, July and November.